Here is a great video recounting tales of President Reagan's personal Ranch Jeep. Re: President Ronald Reagan's JEEP !! Nice, I saw something similar a few years ago. One time on some forum the question was asked who would you take for a ride in your jeep based on people alive during your lifetime. I said My Dad, John Wayne and Ronald Reagan. You couldn't make a better selection of Jeep guests !! I also remember seeing pictures of Reagan driving an M38A-1 he had on this ranch, or earlier ranch. I think it was in an old National Geographic, back when they once has a great magazine. 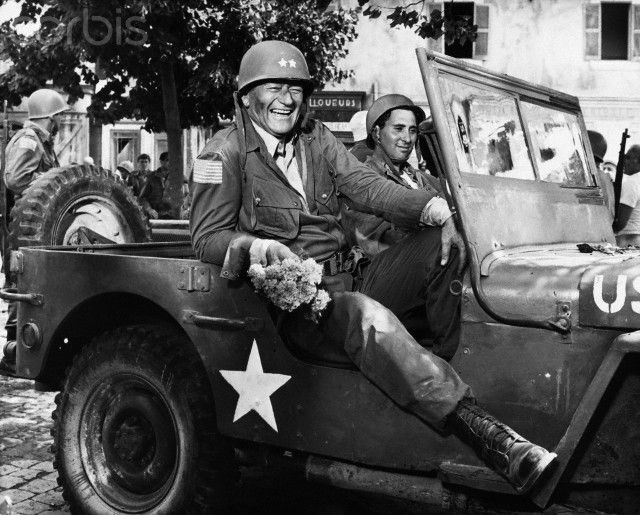 Regarding John Wayne, that's another problem to have him installed in a Jeep . He looked scared in a Jeep. Well he is in my spot and I have the "bigger" 3a! Pretty sure he is looking at a chick as he is already heading out of the jeep. Looks like the Duke had trouble keeping his legs inside a jeep!